I’m a pretty useless person who feels the world is unfit for my presence. Or, more accurately, my presence is unfit for this world. Actually, I don’t think that’s more accurate. I don’t think it’s less accurate either though. I think I just wanted to repeat myself, but sometimes when you repeat yourself you sound super serious and I wanted to sound super funny. Of course no one thought that, but I thought that they thought that and then I felt guilty for my imagined inspiration of their jealousy and then indignant at their annoying jealousy making me feel guilty. “Who are you to be frustrated with my fun? Why can’t you just let me be? This person talking into my ears is funny and I want to appreciate it fully, why won’t you let me?” I continued the conversation in my head with my imaginary opponents. The subway is a really distracting place also. There are too many exciting people to watch who don’t realize you are watching them. I once saw a man dressed in a full yellow suit looking at pictures of himself that he had just taken wearing the full yellow suit. I’ve never seen someone happier. So I took pictures of him to share with the world. It’s so funny!! He’s so funny!! And all I want to do is share funny things, but I’m too serious and so I have to find funny things that aren’t me and take them down as evidence that I recognize funny things. We had a put up circle in 3rd grade. Each day a different kid would go in the middle of a circle and the rest of the students would go around and say one nice thing about the one in the middle. In the midst of the barrage of “you’re nice”s was either a scattered “you’re funny” or “you have a good sense of humor” and I was consistently frustrated with the use of “you have a good sense of humor.” It was used to mean “you laugh a lot” which is the opposite of a discerning sense of what’s funny and what’s not. I have a great sense of humor! I don’t necessarily think I’m funny, but I know what is. 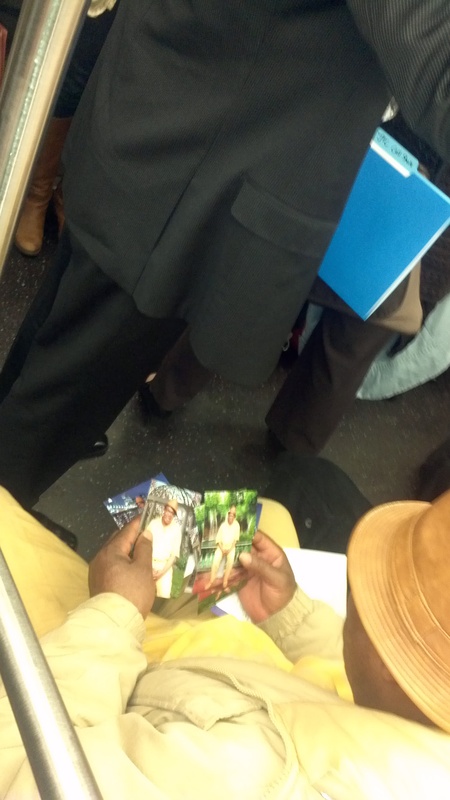 So, while I’m feeling embarrassed for laughing on the subway I notice something much funnier than This American Life. 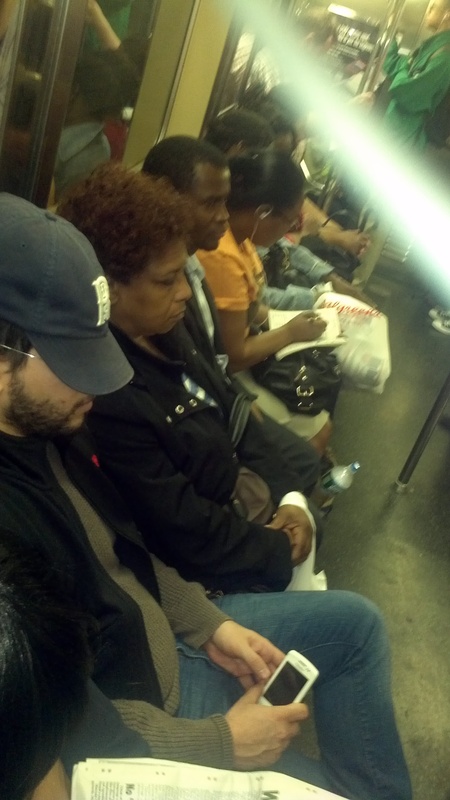 There is a man asleep on the subway. Not all that funny. His baseball cap is about to fall off. Still not all that funny. But I notice that he has his Iphone out and it is on his calculator app which is displaying the number 10.5864… This is very funny. There is some epic story here of a man battling his demons trying to overcome the obstacle of sleep to do one last subway calculation – to find this number that will solve all of his issues, and just as he does he falls asleep. Or it’s less epic, and he was so bored by the bath he was doing that he fell asleep mid-calculation. Falling asleep mid-task is very funny to me, but especially when it’s a task that is necessarily completed on a calculator. I held my phone up high as though the glare was preventing me from seeing which hilarious song I was listening to, then aimed it down to take a photo of my sleeping accountant. And I snapped the photo discreetly. Except that I forgot to turn off the flash and I awoke my subject, attracted more attention, tried to turn off the flash and ended up taking a photo of my feet with a flash, and had to rush off the subway two stops too early out of embarrassment. Also. His phone screen went to sleep right before I flashed my picture and therefore nothing is funny about this photograph. Nothing is funny about me.